The Ascot is a fresh new feeder design that has been built to suit all chicken keepers, it covers every aspect of poultry keeping being adaptable for use with free range birds as well as birds that are kept in a confined environment. The feeder has two types of base one with a feed saver grid and another that is open making it suitable for all birds including waterfowl. Each feeder can be used with or without the removable legs, allowing it to be used as either a free standing or hanging feeder, there is also a cover top to protect the feed when being used indoors. This feeder is suitable for 4 to 6 standard chickens that are fed on a daily basis, the feeder has a capacity to hold up to 2.5kg of feed. 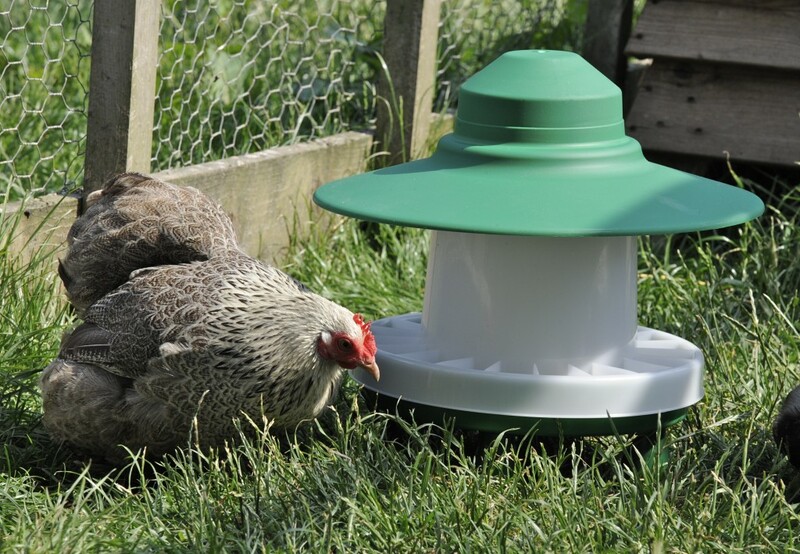 For free range use the Ascot feeder can be stood on the optional 3 – inch legs, these ensure that the feed is kept clean and free from ground contamination. 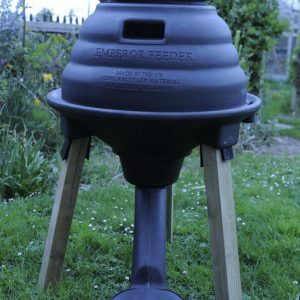 There is also the fully waterproof rain hood, this hood has been designed to fit easily but securely to the top of the feeder barrel, this makes it almost impossible for the birds to remove while feeding ensuring the feed is kept in a good dry condition which is especially important in adverse weather conditions. Using the Ascot as a hanging unit is made quite simple by having a strong metal bar that fits tightly inside the top of the feeder tube, this gives a place to fasten securely the chain or cord needed to hang the feeder. When hung- the chain comes through the smaller top cover again making sure the feed is free from contamination. Filling the feeder is simple, just remove the top and add the feed that finds its own level in the feeder base. This feeder will suit every chicken keeper’s requirements and is compact enough for even the smallest coops where size is important when space is limited. 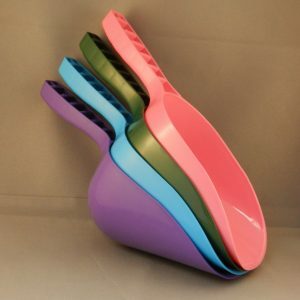 Be the first to review “2.5kg Ascot Feeder” Click here to cancel reply.